With recipes from our staff and authors you're sure to find a favorite in our short, but very free cookbook ebook! Designed and assembled by the MPP intern there is lots of tidbits on Master Point Press' beginnings and staff. 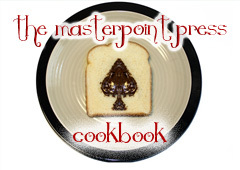 Get to know who brings you the best bridge books and catch a few fun recipes while you're at it!